Bella Abzug: A much needed primer on the premises of personal privacy underlying lesbian/gay civil rights and reproductive freedom, God's Country is a must for Americans. John Money, PhD: Americans are already imperiled by an excessively dangerous amount of religious dictatorship in government. Read SandyRapp's book and awake to the peril. Sandy Rapp is a songwriter, activist, and author of God's Country: A Case Against Theocracy: The Haworth Press; 1991. Her best known song is "Remember Rose: Song For Choice," which features a guest vocal by the late Congresswoman Bella Abzug (D-NY), and recounts the first back-street abortion fatality of the 1977 Medicaid-Abortion cutoff. Rapp is also known for "Everyone Was At Stonewall, (final update)" a gay history song, written for police sensitivity training, which won Stonewall Society's Pride Song of 2004 and was featured on the 6/8/2015 "This Way Out Int'l LGBT Radio Magazine". Rapp was instrumental in the passage of a number of gay civil rights laws on Long Island, NY. In the 70s and 80s Rapp had the house band at the Hamptons resort Baron's Cove. She has performed at many Hamptons venues and has played over sixty ARF (Animal Rescue Fund of the Hamptons) events. 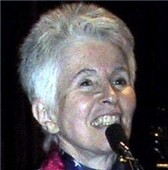 Rapp's other appearances include the million-plus ​2004 March For Women's Lives, the National Women's Music Festival, National NOW Rallies in Seneca Falls, Manhattan, and Washington, DC, National Women's Political Caucus Conferences, Gulf Coast Womyn's Festival, Chicago's Autumnfest, New York State NOW Conferences, Montana Pride Rally, Palm Springs' Gay Veterans, Manhattan's Peoples Voice Cafe, the 2001 NOW March on DC, the Gay Millennium March, the '03, '05, '06, 2010, and 2013 National NOW Conferences, the 2005 Save The Court Rally in New York's Union Square, the Molly Yard Memorial in DC's Hart Senate Office Building, and the 2009-2018 Stonewall Veterans' reunions in NYC's LGBT Center. In 2006 Rapp received two OutMusic Award nominations and served as a Grand Marshal of the Long Island Pride Parade. Rapp's premier of "Rise Up Ye Women" at the NYU Law School was toasted in The New Yorker - 11/13/06; and in 2010 Rapp won Stonewall Society's Pride in the Arts Lifetime Achievement in Music Award. In 2008 Rapp sang several Clinton rallies and wrote "She Will Rise" and "Walkin' Shoes" for a Hillary website. In 2012 Rapp played the NYC Kate Millett Festival, the Lynn Buck Memorial at Canio's of Sag Harbor, NY., and in 2013 the Front Lines of Feminism event at the Wilton Manors, FL Pride Center, reviewed on the VFA website. In 2015 Rapp played the East Hampton, NY Women's Equality Day event. See Rapp's 2008 Seneca Falls, NY 160th Anniversary performance of "Walkin' Shoes" at YouTube.com/SandyRapp. ​Sandy Rapp's "Walkin' Shoes" was shot by Mary Scott of MakeBelieveTV at the 2008 Seneca Falls, NY, 160th Anniversary of the first-ever women's conference.